Home » Philatelic » Postage Stamp Controversies! 1. 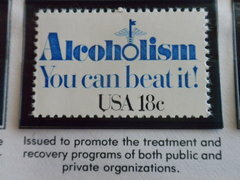 Good Intentions/Bad outcome: In 1981 the US Postal Service issued a postage stamp with a message, “Alcoholism – You can beat it!” Unfortunately, the message was not received well by a broad audience. Some of the recipients of letters containing the stamp voiced concerns about it. After a few months the post office issued a statement suggesting the person receiving the letter might take it personal if he/she had a drinking problem. They continued printing the stamp. 2. God Save the Queen: In the UK (and the US up until 2 years ago) no living person could appear on a postage stamp. In 1999 Royal Mail issued a posthumous stamp featuring the lead singer of Queen, Freddy Mercury. Controversy arose over the background image of drummer Roger Taylor in the background. Although his image was vague, rules are rules and it did lead to plenty of complaints. 3. Celebrating the 50th anniversary of WWII: In 1995 the post office made one of it’s greatest mistakes by issuing a stamp with the image of an atomic bomb explosion with the message “atomic bombs hasten war’s end.” At the time relations between Japan and the U.S were strong, so with a push from the Clinton administration the Postal service decided to replace the stamp with one honoring President Harry S Truman instead. 4. The Legend of Bill Pickett: In 1994 the U.S Postal Service printed and released 20,000,000 of their “Legends of the West” commemorative sheets. Bill Pickett was one of the 20 Legends honored to appear on the sheet. Unfortunately, the caption of the picture used to create the stamp was mislabeled and it was the image of his brother Ben that appeared in the original design. The post office recalled the stamps but later issued 150,000 of the error sheets through a lottery. 5. Stamps depicted dangerous activities: The most recent controversy was a series based on Michelle Obama’s Let’s Move campaign. It had images of children performing outdoor activities. The White House rejected three of the fifteen as “unsafe” which included kids cannonballing, performing headstands without helmets, and skateboarding without kneepads. There are plenty of other postage stamp controversies. With every decision the postal service makes you can bet the government, philatelists, activists, and even your everyday critics will be waiting to mail in their disapproval of what image should or shouldn’t appear on a stamp. On December 31st 2014 Nick’s Stamps will be holding a raffle to help raise donations for Animal Safehouse. One winner will be chosen by mini web tools random name picker and will receive the world’s first issued postage stamp, The Black Penny! I have a couple of stamps babe ruth stamps just alot of others. But just want to know if you buy any just a little extra money for Christmas. I acquire a stamp collection several years back I got hooked on collecting unfortunately Iam going through some financial hardship and you seem like a good business man that will appreciate my collection.if interested email me at gjoser500@gmail.com… Hope to hear from u.